In the first week of October, my husband’s uncle and godfather, Dave, died. It was sudden. Dave was here on Wednesday and gone on Friday. He closed his eyes and didn’t open them again. He didn’t say goodbye. Here. Then not here. Just like that. A month later, the family was discussing Thanksgiving. The meal is always a group effort. 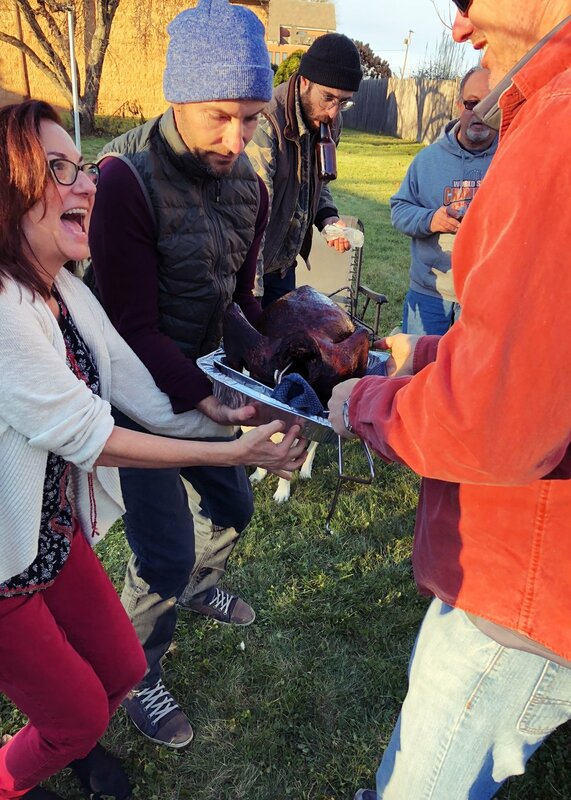 And Dave had been in charge of the main event — the turkey. He liked frying it. He’d bring a whole setup: propane tank, burner, pot, thermometer, eye protection, gloves, weird upside-down-hanging device, etc. He was like a mad poultry scientist. Dave’s son, Ross, decided to take over his father’s turkey duties. He enlisted my and Joe’s help. We discussed brine recipes. We debated — then quickly dismissed — the idea of incorporating a Manhattan cocktail (Dave’s favorite) into the mix. We laughed. We made memories. We bonded. Hi, Dave. Joe and I would buy and brine the bird. Ross would go to his dad’s house and bring the equipment. We would meet at Grammy’s. The tradition would continue. We scheduled a brining party for the Tuesday before Thanksgiving. We FaceTimed Ross in Brooklyn and chatted while Joe and I heated the brine, adding goodies like coriander, peppercorn, bay leaf, and sage. We showed him the bird — the actual bird, I mean. I might have had a little too much wine — I got pretty silly by the end. Hi, Dave. Nothin' like a good old fashioned brining party. On Thursday morning, we packed up the bird—still in her briny bath—into a stock pot and drove three hours to Grammy’s house. We wrapped the pot in an insulated sleeping bag, and put an ice pack, a bottle of rosé, four cans of beer, and then the lid on top to keep her cold. It worked splendidly. The journey across Grammy's lawn. Ross was already there when we arrived. The frying contraption was set up in Grammy’s backyard, a stone’s throw from the makeshift memorial Dave’s brother, Bob, had set up in Grammy’s garden—the one Dave tended for her. Dave really, really loved gardening. On the folded index-card to-do list we found in Dave’s wallet at the hospital, he’d written “BOB — CUKE.” It wasn't crossed off yet. I wonder where that cucumber went. Here. Then not here. Just like that. We proceeded to de-brine the bird, hosing her off with the garden hose (classic), then we hung her up to dry in the garage (also classic — at least at Grammy’s house) while Ross started heating the oil. Joe’s sister’s dog kept trying to lick up the brine — first from the grass out back where we’d de-brined, then from the drops that were plinking and plunking onto some broken-down paper bags placed underneath the hanging turkey. Even without the dog, it still wasn’t an entirely smooth process. The oil didn’t heat very fast. Then, after we’d lowered the bird into it, it didn’t come back up to temperature for a long time. No one mentioned it, but I know we were all thinking it: We wish Dave were here to help us out. No one had thought to ask him about it when he was here. Bubble, bubble, turkey and trouble. But life goes on. The oil eventually came up to temperature again. Ross looked good wearing Dave’s goggles — they’re more like shop glasses, passed down from his mother’s father, I think. They’re flecked with paint and only God (and now Dave) knows what else. They fit Ross well. Where there's steam ... there's turkey. While the turkey was bubbling away in the pot, Bob held a short memorial for Dave at the garden. He quoted a Bruce Springsteen song. He said a few words. We scattered some of Dave’s ashes. I had ashes on my hand. I simultaneously freaked out a little and laughed to myself. Surreal. I turned my back on the memorial and walked over to the turkey. I held my hand over the pot. I blessed the bird with my ashy fingertips. Hi, Dave. The memorial ended. Aunts, uncles, cousins, and siblings chatted. Beer bottles clinked. Steam rose up from the pot. Life went on. The turkey came out. It was beautiful. Joe took it inside to let it rest. Ross threw a handful of hot dogs into the hot oil — another Dave tradition. They were done within seconds. Ross placed the hot dogs in buns, wrapped them in wax paper, then put them all back into the hot-dog-roll bag. Just like Dave used to do. Ceremonies come in many different shapes and sizes. Ours took place in a sleepy New Jersey town on a cold November morning, and involved boiling vegetable oil, fog-colored ashes, and paint-flecked goggles. There was no pomp. There was a bittersweet circumstance. But it was a ceremony all the same.